I have so much love for masala chai. This nourishing, aromatic drink with warming spices is an Ayurvedic classic, just like golden milk turmeric latte. Masala chai means spiced tea and dates back to ancient India. It is believed that a king created it as a healing beverage according to Ayurvedic principles. Since then the family recipes have been passed on through generations and have spread throughout the world. Masala chai is traditionally used to treat colds and digestive problems. Some of its characteristic spices are cinnamon, cloves, cardamom, star anise and fennel seeds. In this article you can read about the health benefits of the Masala chai spices. While it was originally made using cow milk, dairy-free masala chai is very common nowadays and as tasty as the original! Popular plant-based milks are almond milk and coconut milk. Coconut milk masala chai is creamier and richer than the almond version. They’re both really good, it’s a matter of preference. 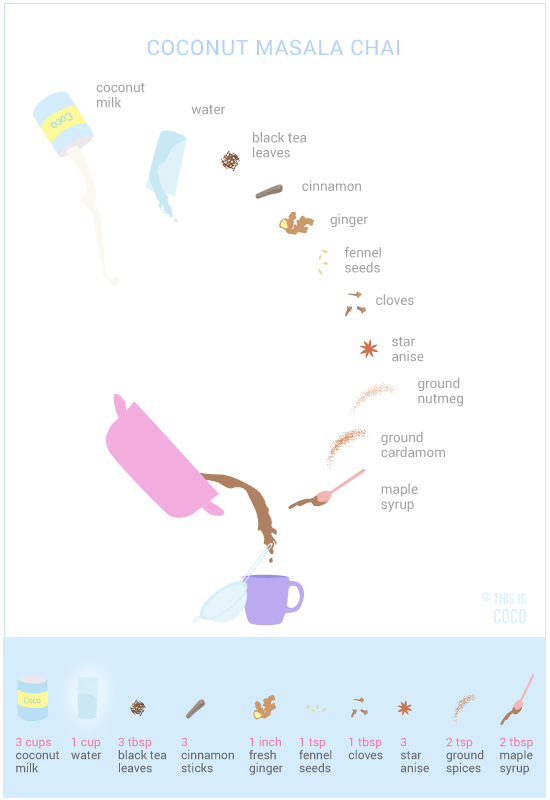 Originally masala chai didn’t contain black tea. This started later as result of the British and their tea plantations in India. Nowadays they usually prepare it with black tea, but you can easily omit it or substitute it with some herbal tea. I have a special place in my heart for natural food with soul and roots. Something that was created hundreds of years ago and has shown its wonderful properties ever since. Plus it’s just so, so tasty! Take a big pot and pour the coconut milk and water into it. Add all the spices and other ingredients besides the maple syrup. Stir well to mix everything. If you want to make it caffeine-free, leave out the black tea. It has enough flavor by itself. Cook on medium heat for about 30 minutes. Stir regularly. Turn off the heat and mix in the maple syrup. Stir well and let it sit for 10 minutes. Use a mesh strainer or bag to separate the whole spices from the chai. Use half a cup of the coconut milk masala chai mixture for half a cup of hot black tea. Pour the remains into a bottle or sealed container and store in the fridge. 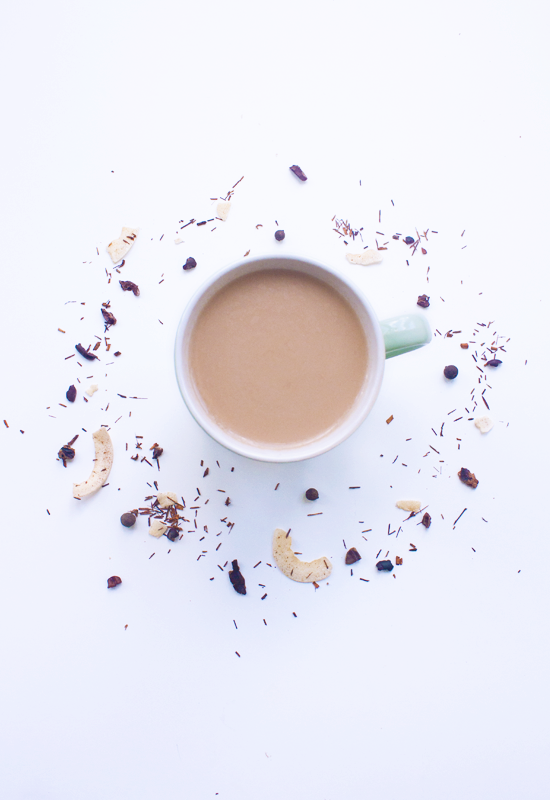 Enjoy your coconut milk masala chai with a piece of banana walnut cake! Welcome to This is Coco! 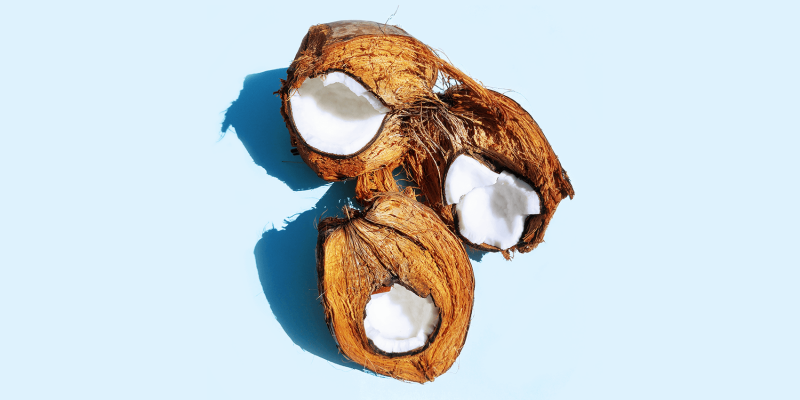 Is the coconut a nut, a seed or a fruit? Never miss a new post again! © 2019This Is Coco. All rights reserved.